The top shows how the room started at the beginning of the year. I pulled an astonishing amount of stuff out of it, and realized that I couldn’t bear the wall paper. So it is down to bare walls (as you read here earlier) and I primed it today. If I start tomorrow early, I should be able to get two coats of paint on all the walls. Then all I have to do is decide which of several possible bench/storage ideas will be work. Actually they would all work. I am aiming for some happy balance of done, not blindingly expensive, and easy to work with. I think it all requires a trip to Ikea. 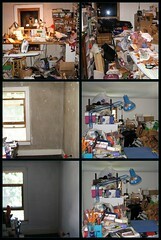 Wow.. My studio/ office, looks just like your before pictures. It is to the point where my creativity is being totally stifled, so time to start shoveling it out. Just waiting for the motivation. I am looking forward to see pictures of your completed room.